I love House of Cards – both versions. When I first started to watch the UK version, I thought I was about to see a dated precursor to the excellent American, Netflix series which had enticed me in the first place. I was pleasantly surprised to find enough differences to recognise the two series as separate, distinct shows but with key storylines, characters and moments which the US show retained. The two protagonists of their respective shows are brilliant. They are the reason why the series are so successful. Kevin Spacey oozes a charm but has a darker, Machiavelli streak which makes him unpredictable. Ian Richardson’s Francis Urquhart seems more calculating and in control, although he can also snap when it is called for. The difference seems to be in how their actions affect them. Urquhart is haunted by his actions and his murder of his lover Mattie, which ends the first season of the UK show, has repercussions for the next two seasons. Frank Underwood doesn’t seem to let his past actions bother him but does seem ruffled by the pressure around him. His stakes are slightly higher, President trumps Prime Minister, but when he also murders his lover, it is done with little remorse and doesn’t seem to bother him at all. It is here that I prefer Frank Underwood. 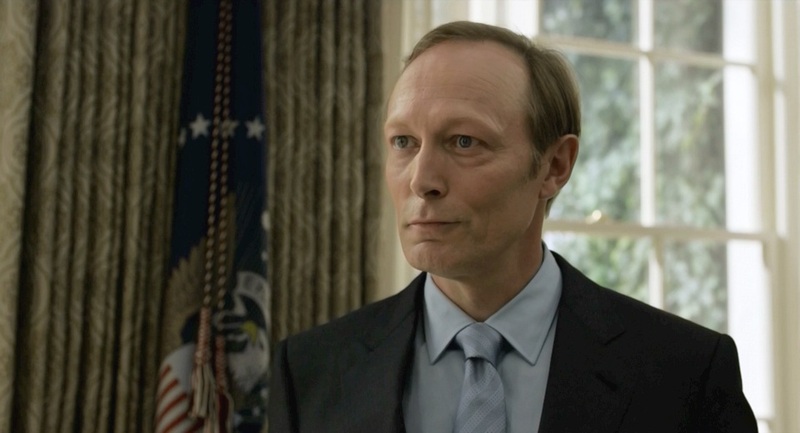 He is a more sinister villain but also more charismatic, even three seasons in, I’m still rooting for Underwood where Urquhart lost me once he’d taken on a King and won. A “hero” is only as good as the villain and when your hero is already pretty awful, the villain must be worthy. The first season of both series introduced the dark character of Urquhart and Underwood and their “villains” were the leaders of their respective countries. The second season gave Urquhart the greatest of villains, The King of England, and subsequently, once he was vanquished, the third season left little to stand in his way. Underwood has taken on the President, a business tycoon with a vendetta and a Russian leader with war on his mind. His villains have always been more interesting and the way the third season ended, it seems his newest villain could be the best yet. The woman behind the man. It isn’t until the third season that we really get a look at Elizabeth’s Urquhart’s influence and how evil she is compared to her husband. She pulls the strings and eventually makes the ultimate sacrifice but she is never more than an evil Emperor in the shadows while her Darth Vader destroys planets. Clare Underwood has always been at her husband’s side and has proven to be both an ally and a thorn in his side. She has been as integral to his success as his schemes and plans but with the rough third season and the largely unresolved cliffhanger, we could get a new dynamic in their relationship which could be the undoing of Frank, like Elizabeth was for Francis. The US version of House of Cards has the benefit of many more episodes so can flesh out a lot of the supporting players. Not that the UK version shied away from telling a deep, complicated story but it doesn’t match the ambition of Spacey’s vehicle. Characters such as Doug Stamper, present in both series, playing the enforcer for their country’s leader, get a much more developed tale in the US version and is still proving a integral part of the story in the US version while the character was dispatched by the end of the second season in the UK. It also means we often get strands in the US which don’t quite go anywhere or episodes which feel like they tread-water instead of moving the story swiftly forward. The depth is the strength of the US version while even the third season of the UK House of Cards began to feel like it limped towards it’s conclusion. Overall, the winner is actually quite clear and it isn’t because it is more recent. More care, time and development has been spent on the US version of House of Cards. The main character is more interesting, the support have proper stories and the villains are always a real match for the “hero.” I loved the UK version but Spacey would definitely outwit Richardson’s Urquhart. Previous Previous post: There are only 3 reasons you should remake/reboot a movie!